These are the faceplates of the valves - These screen shots were captured when the system was in semi-simulation mode, and hence the absence of the Alarm Acknowledge and Alarm UnAcknowledge. These Valve faceplates have all the same features as the Motor Faceplates of the previous page and have a few additional features. When presenting information to users the most symbolic approach is usually the best and this is a good example of presenting information to the user that is absorbed by the user without their knowledge - subliminally. Basically the outline of the OPENED or CLOSED box is driven by the Output command to the valve to operate rather than the position of the limit switch. This is powerful subliminal information - during normal operation of the valve the user gets used to the outline of the box changing in advance of the OPENED or CLOSED text. So that when a failure does occur the outline would then be seen to change before the valve fails, this would indicate that the problem lay externally to the PLC ( control system ) and that should be the focus of the investigation. If the outline failed to move the user would automatically ( and rightly so ) start looking within the software for interlocks etc. The user has been presented with information without consciously absorbing it. 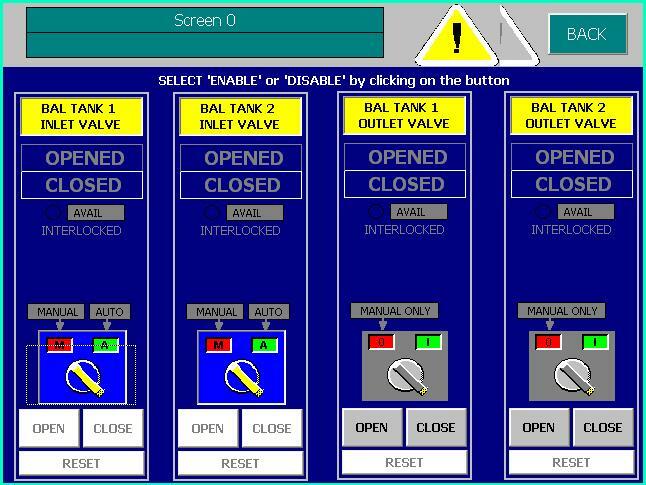 The third and fourth faceplates don't have an Automatic mode and thus always available to be operated in Manual mode - although the code in the controller ( PLC ) is no different and the 'AutoCmd' is just strapped to the 'ManCmd' flags external to the subroutine.